Is the US starting to kick its sugar habit? America’s sweet tooth is finally being tamed — at least, a bit. In a nation obsessed with weight loss and healthier eating habits, children are eating far fewer sugary sweets than they did 15 years ago, according to data from the research specialist NPD Group. The numbers are eye-popping and the change — which is already impacting the country’s biggest makers and sellers of all things sweet — appears irreversible because the decline is only accelerating. The typical American child ate or drank the 20 most common sugary sweets an average 126 times fewer last year than in 1998, reports NPD. That includes 62 fewer occasions of having carbonated soft drinks and 22 fewer times eating pre-sweetened cereals. Although NPD does not formally define “sweets,” the 20 items in the study were selected based on what is generally accepted as sweet. The Port Washington, NY-based global, independent market research firm has continuously tracked and studied the eating and drinking habits of Americans for three decades. More than 90% of all major food and beverage makers use NPD data. Trailing behind kids — but also seriously reducing sweets consumption — adults indulged in an average 49 fewer sweet occasions last year vs. 15 years ago. Across almost every category of pre-sweetened foods — except yogurt and fruit snacks — children, in particular, are consuming fewer sweets. Among the hardest-hit categories: carbonated soft drinks, pre-sweetened cereals and fruit drinks and juices — all seeing double-digit declines in annual servings by the nation’s youngsters, reports the NPD study. Even then, childhood obesity has more than doubled in children and tripled in adolescents over the past 30 years, reports the Centers for Disease Control and Prevention. The percentage of children ages 6 to 11 in the United States who were obese increased from 7% in 1980 to nearly 18% in 2010. Similarly, the percentage of adolescents ages 12 to 19 who were obese increased from 5% to 18% over the same period. That’s why first lady Michelle Obama has made childhood obesity her chief cause and why New York Mayor Michael Bloomberg also has embraced the obesity cause, even trying — but failing — to cap a lid on soft drink sizes sold in New York City. Well, not quite, he admits. Children still consume considerably more sweets than do adults — 14% more annually — according to the NPD data, with 617 “sweet” eatings/drinkings for children vs. 543 for adults. 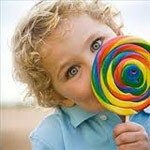 And 98% of adults and children still have at least one of the 20 “sweet” products at least once every two weeks. But the numbers clearly are heading south. That, Balzer says, is primarily because parents are fighting back — and making a dent in the eating habits of their kids…..